In this Slotfather 3D slots reviews At BetSoft casinos we are going to tell you about the infamous Slotfather 3D online and mobile slot machine, and where the best USA friendly mobile and online casinos are to play the Slotfather 3D online video slots for real money. BetSoft online casino gaming software powers this 5 reel, 30-payline video slot machines that have impeccable graphics and a stunning beginning introduction in this Godfather themed game. You can hear the Slotfather saying “I offer them a jackpot they cant refuse” right before the games starts. If you live in the United States of America and are looking for a good USA friendly online and mobile casino to play the Slotfather for real money take a look at the bottom right hand side of this review page. 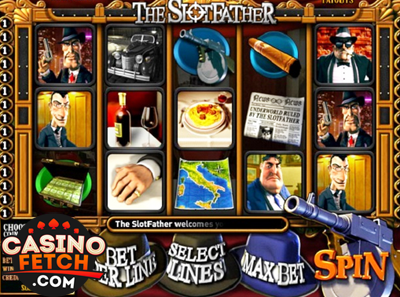 After you watch the introduction to the Slotfather you will choose how much money you want to play the game with. You can choose anywhere from 5 cents up to $1 per payline. The maximum bet per payline is $30. Once you have chosen how much money you are going to play the “Slotfather” online slots for real money with you can click on the “Spin” button or the auto play button. Start to spin the reels and hopefully you will win the bonus games so you can meet the Slotfather in the Underworld for yourself. If you want to read other reviews take a look at the Lucky Tiger video slots review at RTG casinos section. One of the most important symbols that you need to keep your eyes out for is the Underboss symbol. This is the scatter icon in the game and when you land three of the Underboss scatter symbols you will win 50 credits. If you land four of the Underboss icons you will win 100 credits and when you land all 5 underboss scatter icons you will win 200 credits. Keep your eyes out for the bonus games plus the 2 extremely fun features. There is a sneaky instant win feature that you can trigger after you land a suitcase filled with money on the reels next to the Sammy “Quickfingers” symbol on the first, second or third reels. The Sammy “Quickfingers” symbol is completely animated and you can see Sammy take his hand out and put his hand in the box filled with money. The amount of money you win is the exact amount of money that Sammy grabs from the bag. If you are a fan of the Mafia Era then you will love to play the bonus game. The way to win the bonus game is to land 3 or more of the Slotfather symbols on the reels. You will be brought to another screen where you go to work for the Slotfather yourself and you become an earner. You will sit down with the Slotfather in his favorite Italian restaurant. You will help the Slotfather expand his business by placing the slot games into three different businesses around the town. After you are done helping the Slotfather expand his criminal empire he will give you a reward.